The holiday season is an especially wasteful time of year for most households, but you can do your part to avoid this by keeping the planet in mind while decorating, shopping, and entertaining this holiday season. 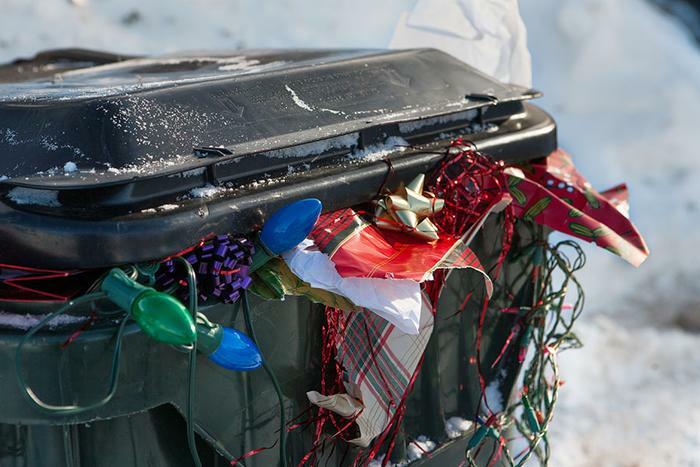 From curbing gift wrap waste to employing a few eco-friendly decorating strategies, here are a few ways you can help cut down on holiday-related trash and excess energy consumption. Regardless of whether you’ll be buying a live or artificial Christmas tree, you can take steps to minimize its impact on the planet. If you will be taking home a freshly cut tree, consider buying one that you can plant outside or keep as a houseplant after the holidays. After the holidays, dispose of your tree at a chipping facility or return it to the environment in other eco-friendly ways, such as mulching or compost. While live Christmas trees are nice, they tend to produce a lot of waste after the holidays are over. To that end, you can consider alternative means of decorating with nature. “Why not go out in your yard or in the woods and gather fallen branches and decorate those with LED tree lights,” says Juliette Haas, sustainability coordinator for the Green Committee of Egremont, Massachusetts. Artificial trees can be a boon to the health of the planet since they can be used for years to come. If you choose to purchase an artificial tree, be sure to keep safety and energy-efficiency at the forefront of your mind when decorating it. Festive string lights are a central element of holiday decorating, but some can be a big energy drain. To keep your lights from adversely affecting the planet (and your energy bill), consider using minimal lights in your holiday decorations. If you do choose to decorate with lights, opt for more energy efficient LED strings. Additionally, use a timer for indoor and outdoor lights to save electricity. ‘Tis the season for gift wrap, shopping bags, and packaging -- but paper used to wrap gifts creates a staggering amount of waste each year. Americans throw out about 25 percent more trash between Thanksgiving and New Year’s Eve than any other time of year. What about all those Amazon boxes that may be showing up on your doorstep? Instead of throwing them out, consider flattening them until next spring and using them as the first layer of sheet mulching. Another way to help avoid extra packaging is to skip disposable containers. Use your actual utensils, plates, and glasses when possible, and avoid sending guests home with take-away containers. Buy snacks and beverages in bulk to reduce the amount of packaging you bring into your life this holiday season, and consider steering clear of using coffee makers with one-time use filter bins. “Also, if you are doing a lot of cooking, composting kitchen scraps like onion skins, carrot and potato peels and coffee grounds greatly reduces the amount of waste you produce,” she added.